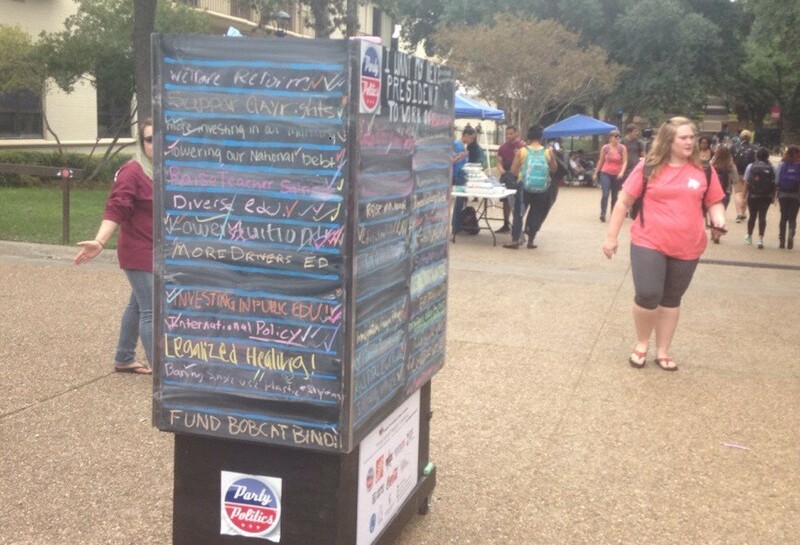 Texas State University was chosen as the inaugural campus for the Chalkboard Campus tour that was launched by Party Politics in coordination with the Organization of Student Social Workers. According to Politics 365, Party Politics is a national organization that is based in Washington D-C that creates non-partisan ways to add fun to the political process without mention of political party. The chalkboard stayed on campus from October 26th to October 30th and was maintained by the Student Social Workers. The school of social work is a vibrant and growing unit of the College of Applied Arts. The school has long been committed to preparing social workers to practice competently with those clients who are most forgotten in our society. The organization that the school has created for students interested in social work promotes a closer bond among those students. The organization serves as an advocacy and service organization for social work students at Texas State. The organization is student-run but a faculty advisor is involved to help students succeed. Membership is open to all majors and the organization sponsors a number of social events and community service projects throughout the year. One of those events happened to be the Chalkboard Campus tour on Texas State. The Organization of Student Social Workers President Michael Hart, explained what the event meant for the organization. According to Michael Hart, Party Politics is an organization that wants to redefine politics. The mission of Party Politics is to turn people on to politics. According to Politics 365, politics have become dirty and divisive for many US citizens. The organization has set out to put the party first in political campaigns and make the process a more enjoyable one for students and citizens across the nation. Texas State School of Social Work Department Chair, Karen Knox says the public art display is a fun and engaging platform for students to connect with others nationally. According to Politics 365, Social Work is the professional practice of engaging with individuals and communities to empower change, growth and health; this event is just an example of the many ways for social work students to achieve that connection. It will reveal people’s potential and their deepest concerns for change in a way that will connect them with a broader audience and bring greater autonomy. Over 7,000 students participated, averaging approximately 1,500 students a day. Students were able to write the issues they wanted addressed on the board as well as talking with Michael Hart and other Social Work members to get more involved in the political process. Michael Hart says that one of the best attributes of the campaign was that students were connecting with each other by the issues they wanted addressed. The board filled up rather quickly and the Organization of Student Social Workers began a ‘check mark system’. Michael Hart said that turnout was a great experience for the organization and the campus. According to Michael Hart, Party Politics chose a chalkboard to express the public’s concerns because chalkboards are usually affiliated with education. Hart said that with the chalkboard, students and citizens now have the opportunity to educate politicians on the issues they would like to see addressed. 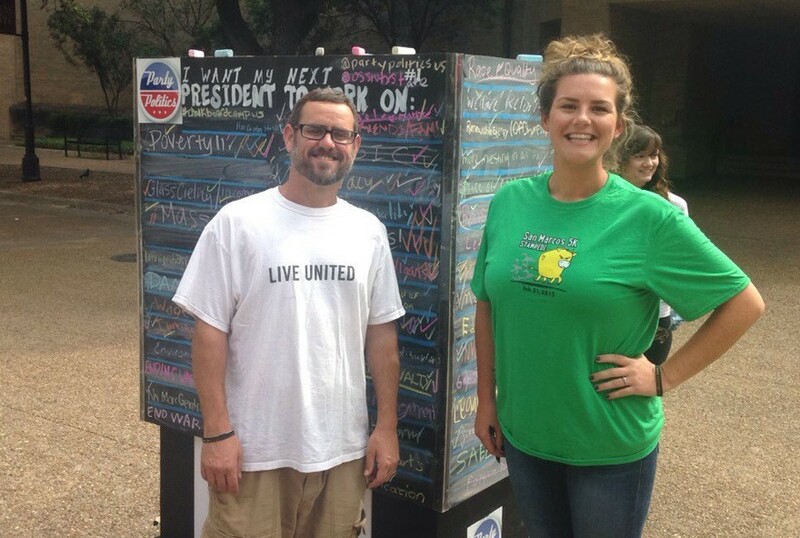 The chalkboard was placed in the mall area of the LBJ Student Center on the Texas State campus where it saw great activity and the involvement grew by 500 students a day when it was moved into the Quad area of campus. The chalkboard reads “I want my next president to work on:” and leaves several lines blank underneath for students to write the issues they would like to see addressed. Some of the issues written on the board were Healthcare, Wealth Distribution and Prison System Reform. These are things the School of Social Work would like to get the community thinking about with the local elections occurring so near to the event. The Texas State Student Government says they encourage students to vote and are available to help students be an informed voter. One of their goals is to help students realize their civic duty and are present at round table events on campus to debate the issues that are important to San Marcos. Michael Hart says that he feels each candidate brings something to the table to better San Marcos. Some candidates bring some great experience in office and others are great newcomers who are offering a lot of great new ideas. He says it was great to see the candidates on campus pushing voter registration because it was definitely in line with what their campaign was trying to achieve. He further explained the issues that need to be addressed in San Marcos. Party Politics will continue to coordinate the events with various organizations on the campuses to continue this movement of voicing the opinions of those who haven’t had their voices heard. Michael Hart says that Texas State’s Organization of Student Social Workers will continue its involvement in the movement. The chalkboard will begin making its way to Drake University in Des Moines, Iowa and then jump around to different universities across the nation.